After our trip to Bangkok we headed to the airport to get on our flight to Penang, Malaysia where we were to meet Jonny. When we were going through security much to our pleasant surprise Jonny showed up in line behind us. Since he was flying directly to Penang from Hong Kong we didn't think we would see him, but he missed his flight. Jonny had a week of work to do while we were in Penang, so the kids and I were on our own for the week. 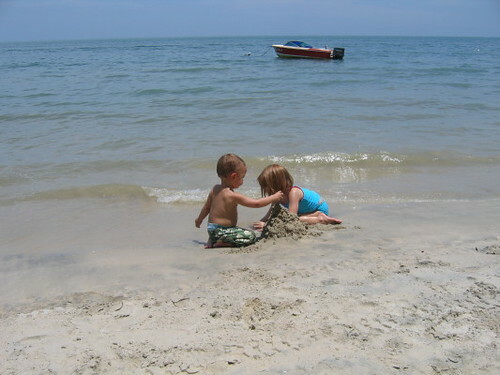 We did a little shopping, toured around a bit, but the highlight of our week was the beach. 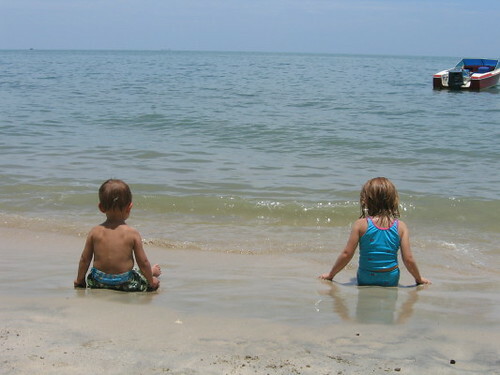 We spent a whole day at the beach swimming, playing in the sand and relaxing. The kids are at such a good age and love to play together so Mommy rented a beach chair and grabbed a book and just watched them play. Here part of the beach. Notice all of the jet skis and boats. There were tons of people trying to get you to rent jet skis, parasail, have beach side massages, go on 4-wheelers, and horseback riding. It was a bit annoying because you were trying to relax, but I guess a massage wouldn't be that bad. Angus and Gemma soaking up the sun! 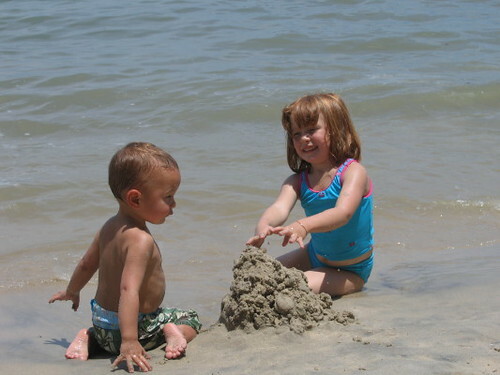 Angus and Gemma building a sand castle. Angus and Gemma with their creation! 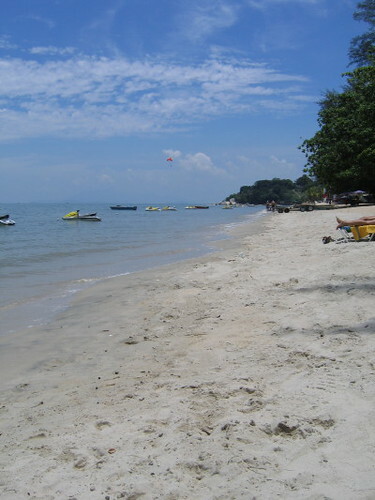 I've spent many days on that beach in Penang. Did you stay at the Rasa? I got a foot massage from this guy who said he was 74 years old. This foot massage turned into a leg massage and then he told me that he knew how to please a woman. I couldn't get off that beach fast enough.